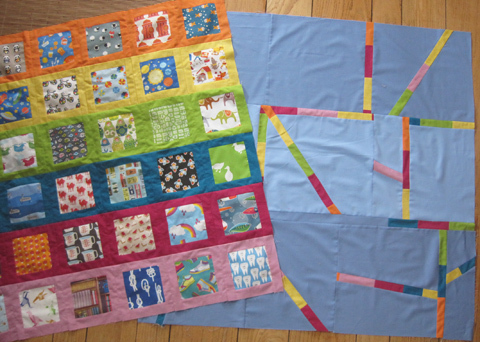 The I-Spy Rainbow Quilt is finished! 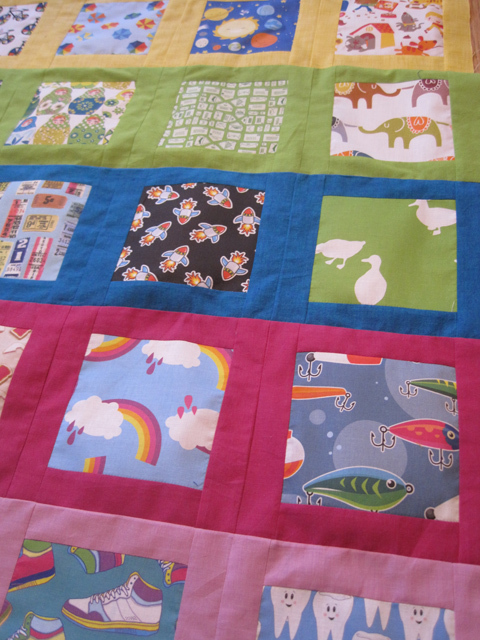 This quilt was so much fun to work on. Even switching out the threads to quilt each section was fun—the threads were all so darn pretty! I’m pretty happy with the way the back turned out, too, considering it was an experiment in improv piecing. For the binding, I just used four of the solid fabrics, one on each side. 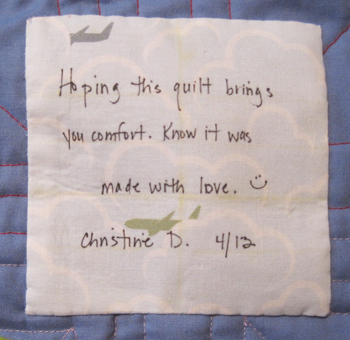 My dream was to make the binding match the solid fabric changes on the sides of the quilt, but that dream faded away pretty quickly—so. much. measuring. So I chose two colors for the sides, and then matched the fabrics on the top and bottom. And, of course, a quilt isn’t really done until it has a label. The label fabric is one of the leftover I-Spy Spoonflower blocks. Next up, this baby goes into the wash (to help wash away my label grid marks), and then off to the Ronald McDonald House, hopefully to go to some rainbow-loving child. My sister Jenny celebrated a milestone birthday on Sunday, and although we don’t usually send birthday gifts, I thought this special occasion deserved one. So over the weekend I whipped up this mug rug for her. 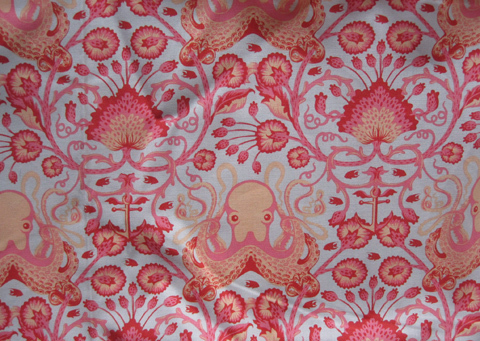 Jenny’s favorite color is orange, so I dug through my stash and found this from Tula Pink’s Salt Water line of fabric. While the fabric can come off pink, I figured I’d add orange fabrics from my stash, so the mug rug would end up orange. But it turns out I don’t have that much orange in my stash. I’m always shocked by this discovery, but somehow, my stash of orange still hasn’t grown. So I hope Jenny like’s pink, too. 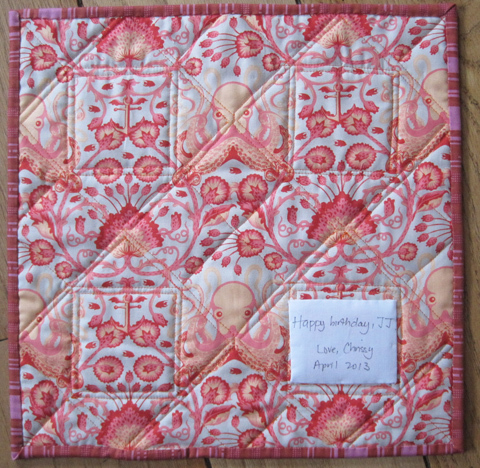 The square-in-a-square block pattern is from this blog post from Craft Buds, which includes a paper-pieced pattern. I started paper-piecing the first block, but I found I wasn’t so good at centering my fussy cut fabric with that method. So I ended up piecing the blocks in the usual way (which really wasn’t too hard for a block like this). The back is just more of the Salt Water fabric. Jenny is the mother of Stella, the niece who received the shark skirt for Christmas, so I wanted to really drive home the family ocean theme. The whole thing took about 5 hours, from conception (“Hey, I should make a mug rug for Jenny!”) to the last hand stitches of the binding. I love that about mug rugs. 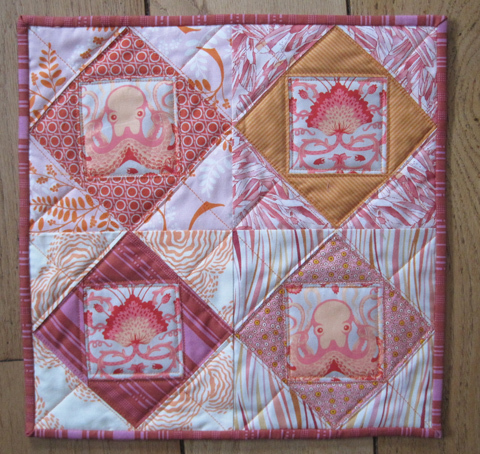 A mini quilt completed in one afternoon! If you’re so inclined, check out Jenny’s vintage Etsy shop, The Fancy Tail. She has a crazy amazing gift for thrifting. I love the vintage linens and houseware she finds, but there’s tons of great items in the shop, including buttons and clothing. Happy birthday, Jenny! Your mug rug is on its way! 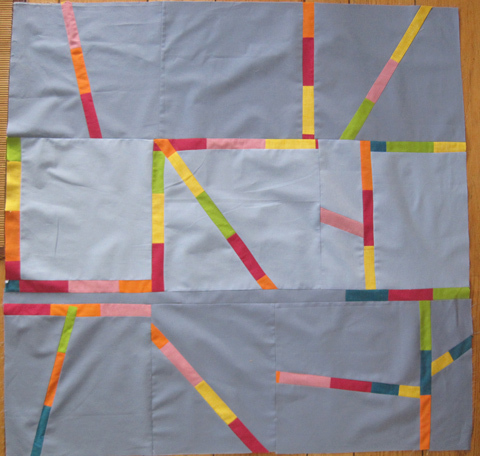 This weekend I tackled the backing for my I-Spy Rainbow Quilt. As I mentioned last time, I had a few scraps of solids left from the top that I wanted to incorporate into the back. My first plan was pretty simple. 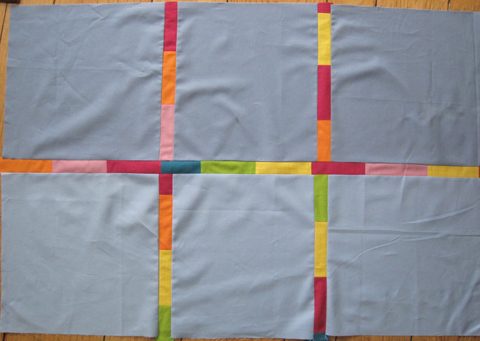 Just divide the backing fabric into squares and use the strips as sashing. Or at least I thought it would be simple. Not only did my sashing strips not match up (grrr), but I did the math wrong and the backing wasn’t wide enough or long enough for the front. Sigh. So I started cutting the pieces I hadn’t sewn together yet and taking apart and cutting the pieces I had sewn together. And then I started sewing. And cutting. And ripping out. Improv land is not a place I go willingly very often, so it took me a bit to really get into it. But finally, I ended up with a backing that was large enough. Some of the rainbowness of the front is lost on the back, since I was just using whatever I had left over. But it’s certainly more interesting and more fun than a simple grid. And I think it goes pretty well with the front. Next up is the quilting. The International Quilt Festival is here in Cincinnati this week (yay! we’re so lucky to have this show right here in town), so that’s where I plan to pick up all the threads I need to match the solids. I may pick up some other things, too…. 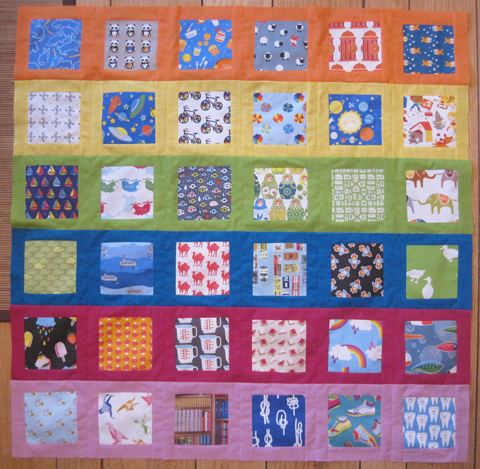 And the Cincinnati Modern Quilt Guild will have an exhibit again this year, so it will be great to see all the member quilts hanging in the show. 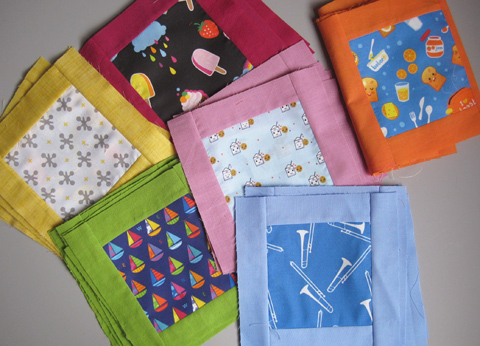 A few months ago already, I won a pack of 5-inch quilt blocks, perfect for an I-Spy quilt. So this past weekend, I dug into them to see what I could make. 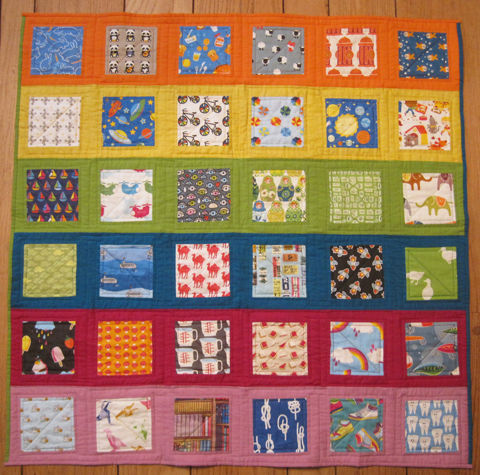 A typical I-Spy quilt is packed with blocks of all different novelty fabrics, lined up edge to edge. I couldn’t wrap my head around that kind of chaos, so I decided to showcase each fabric a bit my adding a border around it. 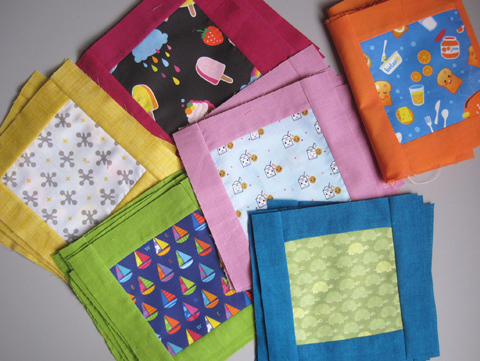 I went to my stash and pulled out a few solids and near-solids to see what worked. 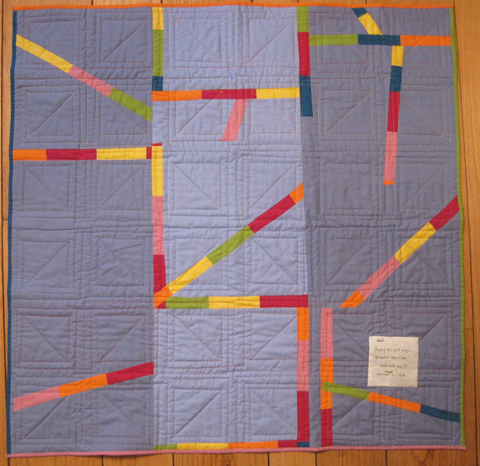 I knew that I wanted to donate this quilt to the local Ronald McDonald House, and their size requirement is 40 x 40 inches. After a bit of math, I decided to add 1.5-inch borders to my 5-inch blocks and place them 6 across and 6 down. I played with the layout a bit, trying the colors in order, randomly placed, etc. And I just wasn’t feeling it. I finally decided that the blue solid was bringing down the party. All but the yellow fabric are shot cottons, over-dyed fabric with super saturated color. And the blue regular solid just felt so dull. So back to my stash to see if anything else would work. There I found a blue that was a lot brighter and more fun. It, too, is a shot cotton, and while it’s darker than I was initially going for, I think it works a lot better. 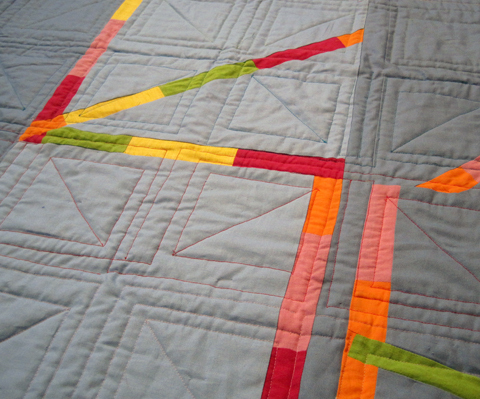 Again I played with the layout, and then I remembered this blog post by Kelly Biscopink, Cincinnati Modern Quilt Guild member and former colleague. In it, she discusses her childhood love of rainbows. At 5, she remembers sobbing for fear that she’d never seen one in real life. Hmmm. Let’s try rainbow order. Of course, this rainbow doesn’t have a red, and it’s heavy on the violets, but will a little kid in love with rainbows really care? I hope not. 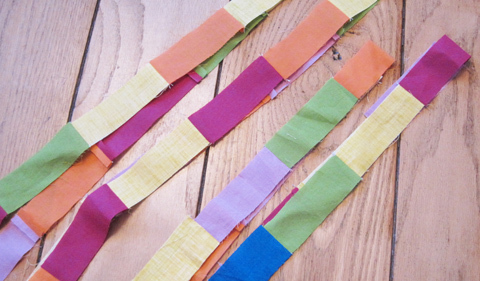 I had many scraps of the solids, so I sewed them into strips that I’ll somehow incorporate into the back. 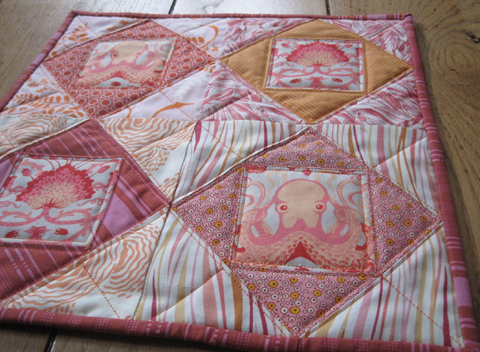 I haven’t decided on the quilting yet. But I’m thinking I will quilt each row with a matching thread. Sounds like good opportunity to expand my thread stash!